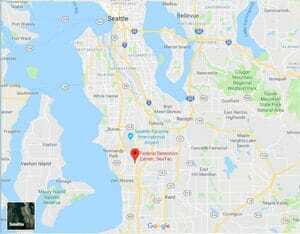 Location: FDC SeaTac is located 12 miles south of Seattle, 16 miles north of Tacoma, 1 mile west of I-5 (200th Street exit). Background: FDC SeaTac was opened in 1988. It primarily houses pre-trial detainees and holdover inmates. Notable inmates include Colton Harris-Moore (released in September 2016 after serving time for theft and burglary), cannabis advocate Marc Emery (transferred to D. Ray James Correctional Facility), and drug lord Clayton Roueche (transferred to USP Lee). Housing: Inmates are housed either in two-person cells or dormitories. Health Services: Medical and dental sick call, physical examinations, chest x-rays, TB tests, medications, chronic care, urgent medical and dental care, routine care, and dentures and partials are all provided at FDC SeaTac. Emergency medical care is available 24 hours a day. Psychology Services: Psychology services at FDC SeaTac include crisis intervention, suicide prevention, brief individual counseling, biblio-therapy (self-help reading material), medication referrals, and forensic evaluations (for applicable inmates). Group counseling services are also periodically available for designated inmates. Groups have been offered in anger management, stress management, coping skills, and dealing with trauma (which includes female inmates with histories of physical and/or sexual abuse). Residential Drug Abuse Program (RDAP): FDC SeaTac does not house a Residential Drug Abuse Program (RDAP), but referrals can be made to institutions which do provide RDAP. The facility does provide a Drug Education Class and the Non-Residential Drug Abuse Program (NR-DAP). Education Services: FDC Seatac provides GED and English-as-a-Second Language (ESL) programs. High school diplomas and post-secondary programs are available through paid correspondence programs. Advanced Occupational Education: FDC SeaTac does not offer any advanced occupational education programs. Vocational Training: FDC SeaTac does not offer any vocational training programs. Apprenticeship: FDC SeaTac does not offer any apprenticeship programs. Library Services: The Education Department maintains a mobile leisure book cart in all housing units, including the Special Housing Unit (SHU). The carts are rotated bi-weekly. The Education Department also provides a wide variety of magazines and newspapers (English and Spanish) that are distributed to the units. The law library is contained in an electronic law database accessible via computer workstations in each unit. Most legal materials can be located by performing a search on the TRULINCS Electronic Law Library database. UNICOR: FDC SeaTac does not house a UNICOR facility. Commissary: FDC SeaTac operates a commissary which provides numerous items for inmate purchase. Inmates are not limited to the amount of money they may spend at any one time, but may not spend more $360.00 per month. Inmates are permitted to shop once a week on their designated shopping day. Recreation Services: Indoor and outdoor activities are available, including aerobics, ping pong, hobbycraft classes, chess club/chess class, wellness and nutrition programs, screenwriting class, movies, and abs class. There are 10 federal holidays in which additional activities are offered. During these specific holidays special tournaments are held (e.g., bingo, card tournaments, pool, ping pong, basketball, and volleyball).